Over the weekend, I stumbled across this photo of me and my sister from the 70’s. I believe she was 6 and I was 9 at the time the photo was taken at my Aunt’s home. This picture brings back a lot of memories of my childhood…with summers spent with my Godmother (who is our Grand Aunt), her sister and our Aunt, eating the best tropical fruits from their backyard, cavorting in the heavy downpours of summer rainstorms and apparently as evidenced by the photo, rocking maxi dresses before I knew what they were. And what about the Kristy McNichol haircut? For those not old enough to remember Kristy from the 70’s show “Family“, click here to see what I’m talking about. For those who remember her, thank God someone else still does. 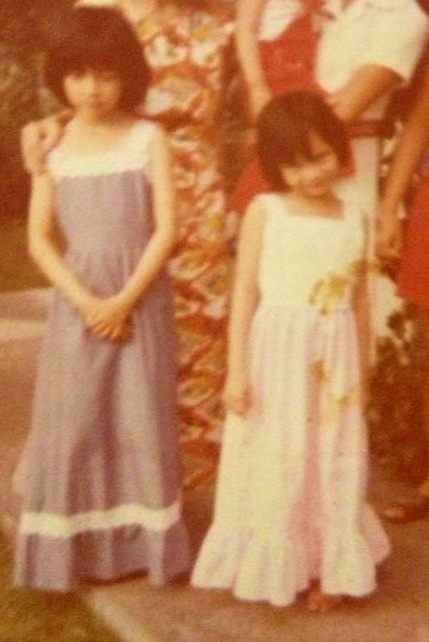 Where I’m originally from (Manila), maxi dresses were called “saya” which at the time didn’t have the flair or modernity that a “maxi” dress now denotes. It was just a long dress that was more hippie chick than hip. I never really thought much about them except they weren’t very practical when trying to climb trees or play hopscotch. Today, as a full time working mom of tween girls, maxi dresses are the easiest thing to throw on especially now that the warmer months are here. And although my tree climbing days are long over, I can still play hopscotch in our driveway with my girls while rocking a maxi dress. Here are some of the current choices out there of maxi dresses that I like – those from Target are affordable and stylish for the price point. These are listed in no particular order….just thought I’d share them while they’re still available online and in stores. That’s it for now!